What Is An eHealth Strategy? Healthcare organisations have been conducting strategic reviews and writing ICT strategies for many years. I think the adoption of the word “eHealth” in our industry – so that we now talk about an “eHealth Strategy” rather than an ICT Strategy – is really helpful because it moves us away from focusing on the ICT part, and towards focusing on how systems contribute to healthcare. Will our current path take us there, or do we need to make some changes? So the first question is answered by what consultants generally call the current state analysis. This should be a frank and fearless inventory of people, systems, capabilities, and technologies. It should certainly include a number of conversations with clinicians and administration staff right across the organisation to understand their view of its current state. The second question also forms part of this current state analysis – really this question is about understanding what the current strategy is, whether it’s been articulated properly or not. For example, it’s not uncommon to find healthcare organisations pursuing a best-of-breed strategy without them ever explicitly agreeing that that is their formal approach. The “where do we want to go” question is what consultants call the future state design. Are we moving towards a digital hospital environment? What are the key areas where our clinicians need more support from ICT? And what are the key strategic goals of the organisation that could be enabled by ICT? At this stage it is generally helpful to get some outside assistance and compare your organisation against the world’s leading ICT-enabled healthcare delivery bodies. The last question is answered by a gap analysis. 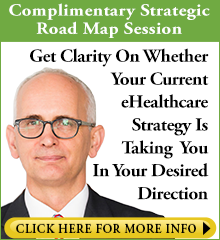 Will the current implicit or explicit strategy take us where we want to go? You also need to consider what you will need to operationalise your strategy, once determined. What are the implications in terms of people, process, and technology – and, of course, money? Once the strategy is written, additional work is often then needed to outline all the detailed projects that are required to achieve it, along with the costs and effort. This becomes the operational plan resulting from the strategy. There is a saying, “If you don’t know where you are going, any road will take you there.” I do find many organisations are not that clear on where they are currently going or how well their current strategy is actually being received by the clinical staff that they are supporting. I have conducted dozens and dozens of strategy reviews for organisations large and small across Australia and New Zealand, and I can tell you from experience that your staff can always tell you where the problems are. And those problems may very well not be in the KPI documents you receive from the help desk, or in the uptime stats that you collect. If it’s true that what gets measured gets managed, it is equally true that what is not measured is often left unmanaged. You need to go out and ask staff what is important to them, and ask how well you are delivering it. I can’t stress enough how important it is to ask good questions and to be willing to take on board the results, no matter how uncomfortable.